Like many of Jonathan Coe's novels (of which I'm a huge fan) Expo 58 has a well-meaning, hapless protagonist trying to navigate his way through a confusing situation armed with only about a quarter of the information he really needs. Thomas Foley is a junior civil servant working for the government's Central Office of Information. Somewhat out of the blue, he is chosen to leave his desk job for a six-month posting at Expo 58 in Brussels, the first World's Fair since the Second World War and an astonishingly ambitious undertaking for its time. Thomas's role is ostensibly to oversee the running of the Britannia, a specially constructed pub which will form part of the UK's exhibit. However, it soon seems there may be more to his appointment than he's been led to believe ... but what, exactly? And what will six months apart from his wife Sylvia and his baby daughter do to his marriage? 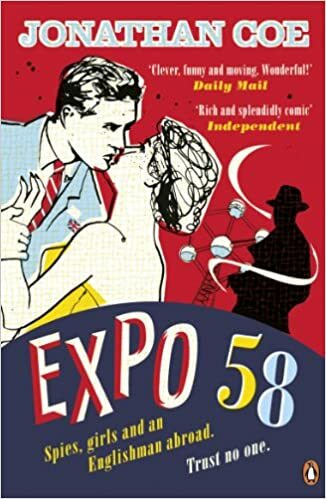 Expo 58 is, as I've come to expect from Jonathan Coe, very funny, with moments and characters reminiscent of Ealing comedy. Two secret service agents form a quickfire double act; a barmaid's name is Shirley Knott; blustering officials threaten to expel a man from a meeting when he references the Queen in a conversation about 'number twos'. Phone lines are bugged in a way that's painfully obvious; kidnappings are bungled; misunderstandings abound. Thomas himself is a classic Englishman abroad: well-meaning, confused, slightly awkward and an unwitting cog in a machine he can't begin to understand. There's also a strong sense of being caught on the cusp of a shift in world politics and social attitudes. Thomas is himself the son of a Belgian refugee from the First World War, and his mother's recollections are an important reminder of the devastation that ripped through Europe not once but twice in just forty years before the vast Expo took place. The Expo is a symbol of all that's bright, modern and forward-thinking and yet at the same time, peppered with elements that are far from enlightened. Families from the Congo appear in the Belgian exhibit to demonstrate tribal crafts as a sort of colonial human zoo for visitors who have never seen black people. In the American exhibit, an actress pretends to be the perfect housewife whose daily fulfilment comes from a labour-saving new vacuum cleaner. In comparison to some of Coe's other novels the plot isn't quite as intricately detailed and the humour is sometimes perhaps a little broader. But it's fair to say that to judge a Coe novel against the author's other work is setting it against a ridiculously high standard, and I'd be making none of these petty quibbles if the book was by a different author. Expo 58 is an excellent read and one which will definitely bear repeat visits, as there are undoubtedly allusions and parallels in it that I'll have missed first time around.